The Add/Edit Packaging window allows you to modify or create new packaging types based on the selection chosen from the menu. From this menu option, you will be able to choose a variety of options from the drop-down including Capsules, Case Types, Containers, Cottons, Cut Bands, Desiccants, Inserts, Lids and Scoops. However, if you have requested custom needs for your unique manufacturing processes, these menu items may be different. By default, the Add New option will be selected by default when the window opens. Complete the required information by filling the empty data fields with the required information and then click the save button to create the new packaging item. 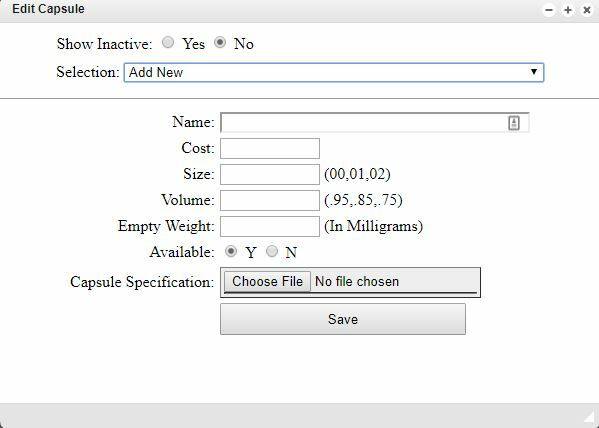 If you wish to edit an existing packaging item, choose the desired packing option in the selection drop-down menu, edit the existing information in the fields below and then click the save button.